Magazine management A.K.A Marvel released this adult theme magazine back in April 1975 the same month GTOL #1 was released and on the newstands. This seldom seen Marvel magazine ran 4 issues and is 116 pages! and squarebound in format and sports a $1.25 cover price. How many out there own or have heard of this Magazine? There is a Film International #1 currently on ebay at auction right now as I speak. What a cool spicy adult theme Magazine to own. These 4 issues are very tough to find. Could someone please post a few scans of these issues if they have any? You got a link to the Ebay auction? Have you tried going to www.eBay.com and in the search bar at the to inputting "Film International 1" and seeing what comes up? (Only one item shows). edit: If you look at his description it states $5 for Priority Mail though, but on a quick glance you'll likely to just skip the auction after seeing the shipping fee that shows up. Uh, you might want to indicate 'not work safe' on that magazine above. Anyway, maybe we should make up a canonical 'non-comics Marvel magazines' list. 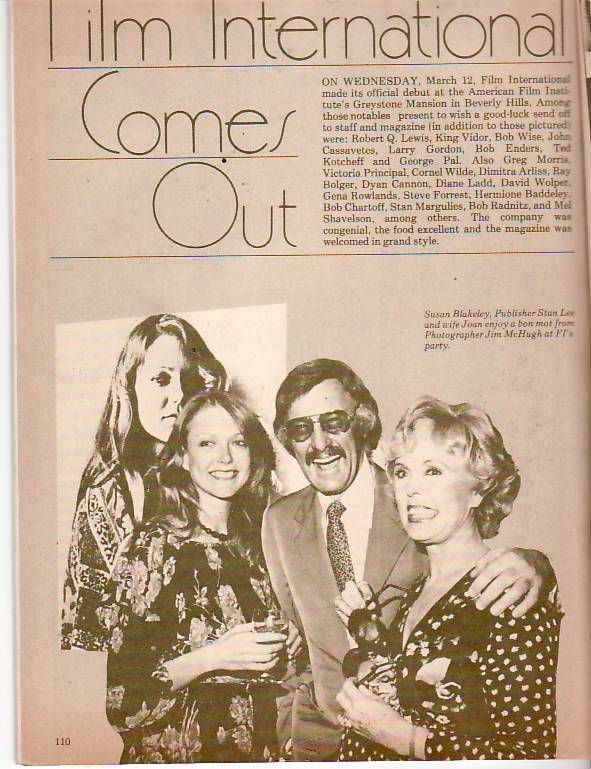 I have a Film International #3 Marvel magazine 1975 that contains a few photos of Stan Lee inside it. What scarce and tough Marvel magazines these 4 issues are to find especially #3,4. I will try to post a scan of the issue #3 I have. I just recently got a hold of all 4 of these scarce mags. These Pictures are inside Marvels Film International #3. 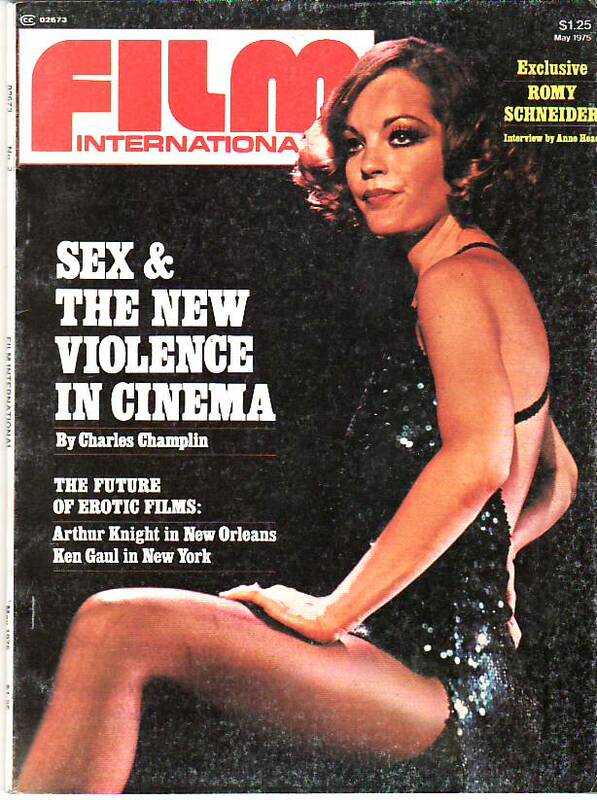 A VG copy of Film International #1 sold recently in a raw VG 4.0 grade for $53.00!. Heres a scan of the truly tough to find Film International issue #4 in a nice VF+ grade!. Here are the covers of Film International #1 and #2. Now all 4 issue covers are displayed to see. Cover on issue #1 I had to censor a tad bit due to its X-rated theme. All issues state Stan Lee publisher on the title page. Best hope to find one of these scarce Marvel mags would be ebay when they appear on there that is. BTW, that's a young Victoria Principal on this cover. Another photo from that session was printed in an issue of People Magazine a few years later and my pal Brian Wilder & I used to lust after it considerably. 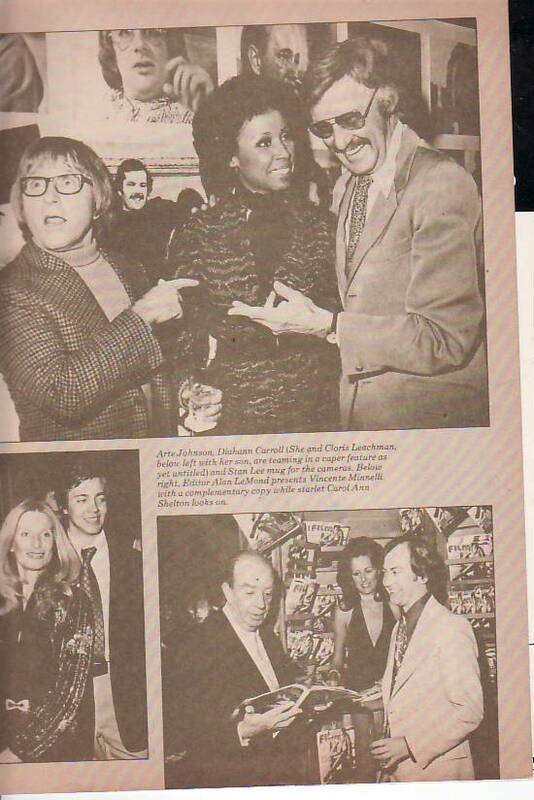 Stan Lee getting his Austin Powers mojo on!